WHAT better way to make up for a result he has described as “embarrassing” than by reaching a Wimbledon final on Centre Court? Andy Murray sailed into the last four of the singles yesterday and will now aim to bury the memories of his 6-0, 6-1 defeat by Roger Federer on the last occasion the players met. No 1 Federer was dealing with Gilles Simon in equally efficient manner. Now the old foes will meet again tomorrow, with Murray admitting he would like to exorcise a result he knows looked bad, but which didn’t concern him half as much as others around him. 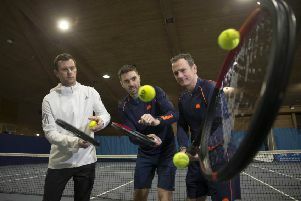 “I was actually quite calm after that match,” he said of the defeat at the ATP World Tour Finals at London’s O2 Arena last November, which raised questions about Murray’s then recent decision to appoint Amelie Mauresmo as coach. “A lot of people in my team, people around me, were very, very worried by that match. I felt quite calm about it. It was obviously embarrassing, the scoreline. “But I looked at the few weeks before then, the matches also that I played at the O2, the matches that I played against Novak [Djokovic] over that period as well, and assessed it and said: ‘Where am I going wrong against the top guys and what is it that I need to do to get back to that level competing with them?’ I dealt with it that way and tried to be rational about it. With the now eight months pregnant Mauresmo looking down from the players’ box, and the Duke and Duchess of Cambridge watching from the Royal Box, Murray continued his strong year by reaching the last four at Wimbledon for a sixth time. The Scot revealed he will now study replays of his last meeting with Federer while also looking back at a clash which holds better memories for him – the 2012 London Olympics final, when he won gold against the Swiss just weeks after losing to him in the Wimbledon singles final. Federer, who defeated Simon 6-3, 7-5, 6-2, was not reading too much into his emphatic victory over Murray in London last year. “He was a bit cooked,” he recalled. “He had won three tournaments back‑to‑back‑to‑back. He left everything out there, making the World Tour Finals. Murray made a point of not throwing his wristbands anywhere near the Royal Box, having been teased about the Duchess of Cornwall’s briefly appalled reaction after being handed the sweaty garment he tossed into the crowd after last week’s win over Robin Haase.